Powerful 9 Channel Discrete Amplifier with Eco Mode With each channel rated at a maximum power of 210 watts, the AVR-X7200W features a left/right-separated monolithic power amplifier design with Denon custom made transistors and identical circuit topology on all 9 channels. 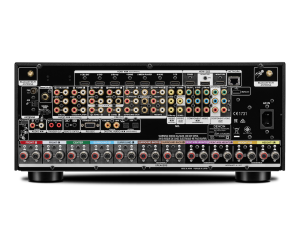 Designed to serve as the heart and brain of your connected home theater system, the AVR-X7200W IN-Command 9.2 Network Home Theater Receiver is packed with connectivity, system configuration and control options. Welcome the new leader of the 2014-2015 Denon AVR range. Featuring ultimate build quality with a left/right-separated monolithic amplifier design and custom made DHCT (Denon High Current Transistors), the AVR-X7200W guarantees best-in-class sound quality with minimum interferences. Thanks to built-in Wi-Fi and Bluetooth, it is perfectly set for all network services including Spotify Connect, AirPlay, Network Music Streaming and Internet Radio. Via its 8 HDMI inputs (including one on the front panel) it handles 4k 60Hz pass through playfully, and even upscales video to 1080p and 4k 60Hz. 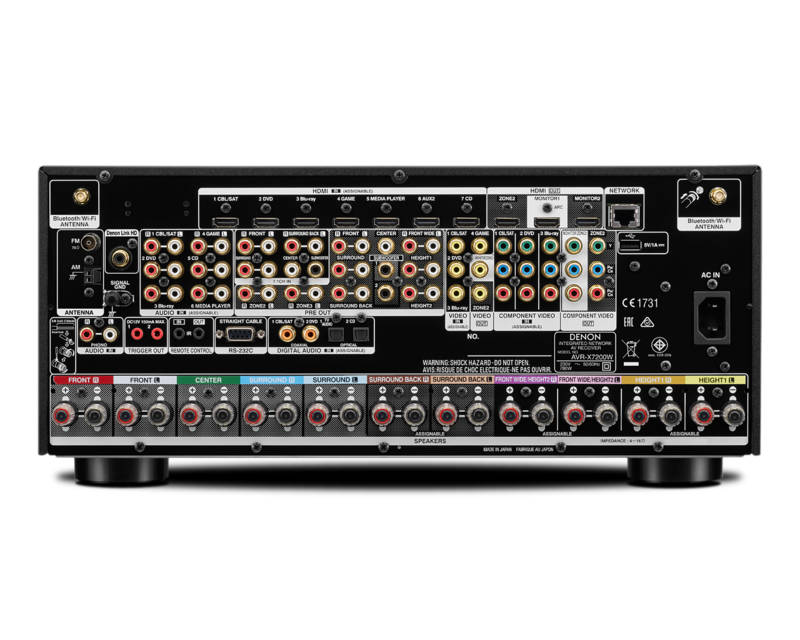 Now add brandnew Dolby Atmos, triple HDMI outputs with multi-source/multizone functionality and integrated Audyssey MultEQ XT32/Sub EQ HT/LFC to guarantee the ideal calibration of your setup. With each channel rated at a maximum power of 210 watts, the AVR-X7200W features a left/right-separated monolithic power amplifier design with Denon custom made transistors and identical circuit topology on all 9 channels. Our new Eco Mode provides the ability to reduce overall power consumption and features an on-screen Eco Meter that lets you see the power consumption reduction effect. The Auto Eco mode automatically switches between normal and Eco modes, depending on the volume level chosen, and the power amplifier block is rated to drive low impedance speaker loads, down to 4 ohms, for compatibility and stability with virtually any loudspeaker model.